Passengers on the Titanic paid significantly different prices for different accommodations. The suites and cabins on the Titanic cost the passengers no small sum for the time. At approximately $100,000 a pop in today’s dollars, you can see why the world’s richest and most elite sailed on the Titanic — only they could afford the parlor suites. For the immigrants who traveled in third class, the cost of a berth was no small sum either. The immigrants were poor, and raising that kind of money (approximately $350 to $900 in today’s dollars) for passage to America was difficult in the early 1900s. This table shows the cost of accommodations in one of Titanic’s suites or cabins. First-class accommodations were located amidships, where the rocking of the ship was less keenly felt and passengers were less likely to get seasick. They were decorated opulently in different period styles: Queen Anne, Louis XVI, and Georgian. The parlor suites came with wardrobe rooms, private baths, and in some cases, private promenades. All first-class accommodations were equipped with telephones, heaters, special gimbal lamps that were designed not to tip over in choppy seas, table fans, and (of course) call bells for summoning the steward. If the parlor suite didn’t suffice, a wealthy family could purchase several first-class cabins adjacent to one another and open the interconnecting doors between the cabins to have a suite of their own. In second class, passengers slept in berths built into the walls of the cabins. At two to four berths per cabin, privacy was hard to come by, although a passenger could close the curtain around his or her berth. Each second-class cabin had a washbasin and a chamber pot to be used in case of seasickness. Second-class passengers used communal bathrooms. 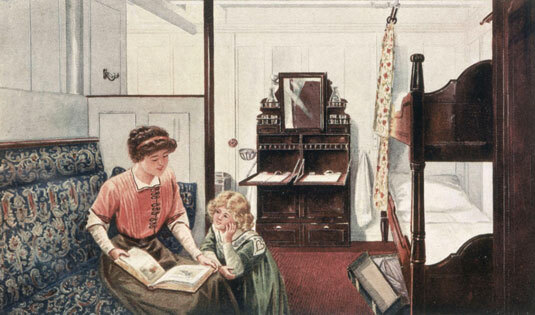 This figure shows a drawing of the comfy, homelike atmosphere of a second-class cabin.